Pope Francis on January 15, 2018, said he is worried that the world is on the path to nuclear war, according to Vatican News. His comments came on his flight from Rome to Chile, the first leg of his apostolic journey January 15-22, to Chile and Peru. 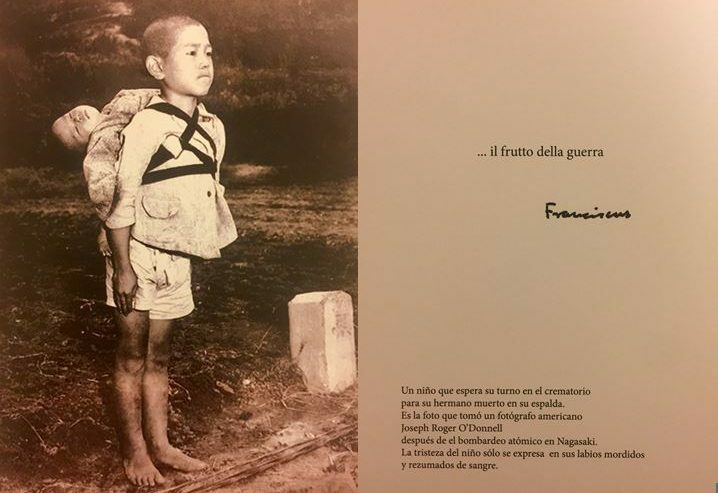 He showed journalists on the flight a picture of a small boy in the aftermath of the atomic bomb dropped on Nagasaki, Japan, in 1945. And he gave journalists cards with the picture on one side and the world “the fruits of war” on the other. His remarks came in the Clementine Hall of the Apostolic Palace, to participants of the International Symposium on Disarmament entitled Prospects for a world free of nuclear weapons and for Integral Disarmament, promoted by the Dicastery for the Promotion of Integral Human Development, held November 10-11 at the Vatican. The Holy Father lamented that the “escalation of the arms race continues unabated,” noting that modernizing arms and developing new nuclear weapons is a great expense for nations and takes away the ability to address “real” priorities: “the fight against poverty, the promotion of peace, the undertaking of educational, ecological and healthcare projects, and the development of human rights”.